Lip Fillers - I love them - Naturally! Recently Dr. Tendler asked me what my favorite service was that I’ve done at Artisan 57. 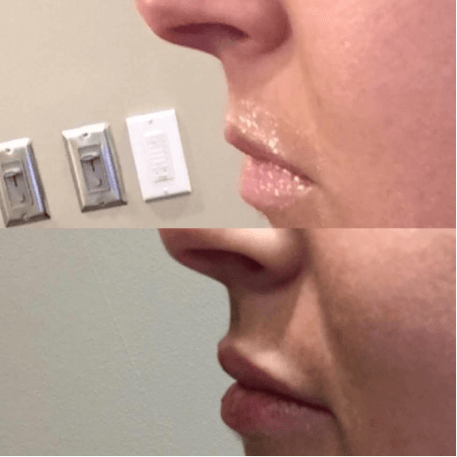 Without skipping a beat I said “My lips!” It’s so easy to go through, with such a fast result! Dr. Tendler used Juvederm filler in my lips and I have absolutely loved the outcome. Most people think of lip injections and they immediately imagine scary looking platypus lips that look oversized and very unnatural. I told Dr. Tendler that I wanted my upper lip to have more fullness to it. I felt that when I smiled in pictures my upper lip basically disappeared and I just wanted to see if their filler would plump up my lips a bit. The day I got my lip filler, I strolled into Artisan 57, admittedly a little nervous, and was greeted by the lovely staff who immediately put my mind at ease. Max and Kennedy were so friendly and assured me I had nothing to be nervous about. Kennedy brought me back to an exam room, cleansed the area around my lips with some alcohol and generously coated the area with numbing cream. She talked me through the process of the injections and told me that the majority of patients don’t complain of pain, just a pinch feeling here and there. I wasn’t considering backing out, but the thought of my lips getting repeatedly poked with a needle was still making my palms sweat. Dr. Tendler walked in and immediately filled the room with so much peace and tranquility that I no longer felt the need to clench my fists. Her sweet demeanor and soft voice explaining everything made me feel safe, like I was in good hands. I tried not to look at how big the needle was, but before I knew it I heard “You’re gonna feel a little pinch here hun”. I kept waiting for the pain and there was none. It was just like Kennedy had explained, mild pinch sensations here and there but nothing that would make me flinch. The whole injection process took only a few minutes. My lips were a little swollen, but I was assured the swelling would decrease over the next few days and it did. It only took a couple days before my lips started looking more natural. I have LOVED them ever since! I love the subtle fullness that Dr. Tendler was able to provide. I honestly can’t say enough wonderful things about Juvederm and other fillers that are offered at Artisan 57! More importantly, I can’t say enough wonderful things about Dr. Tendler and what an amazing job she does! I’ve posted some pictures of my lip transformation below so you can see for yourself!